Autumn is making it's way into southcentral Alaska. The leaves are starting to turn yellow, fireweed is blooming out and it's leaves are turning red and our days are nice and cool. Since I'm in an autumn frame of mind I decided to make a fall themed card with a set from SugarPea Designs. The set is called Lovely Leaves and it has 3 great sentiments that are perfect for highlighting on a card. 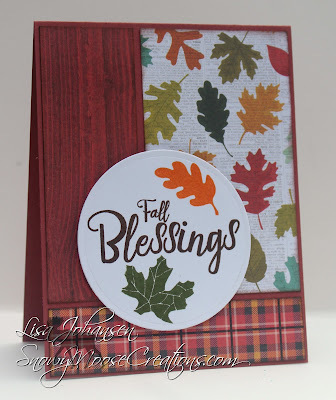 For this card I chose to highlight the sentiment "Fall Blessings". I picked the patterned paper for this card out first and then pulled the colors from it to use on the sentiment panel. I die cut the circle and then stamped the sentiment and leaf images around it for a little extra visual punch. I then popped the circle up with dimensionals. There is no coloring on this card at all, which is unusual for me!